Unless you are a time traveler or have psychic powers, chances are you have no clue who will be our new president when January 2017 rolls around. Speculation aside we’re kicking off President’s Day with something a little less “hot button” and more fun, to celebrate your day off. And what better way to spend the holiday than getting an inside look at the new ride the next POTUS will be cruising in. “The Beast,” the unofficial name given to the presidential state car, will yet again be (technically) another Cadillac. However, this time around it’s a much bigger one than the last, so consider this the blockbuster sequel. So in other words, the next Head of State won’t just have won the election, they’ll essentially be getting… a brand new car! No, there won’t be some type of Price is Right game to determine which vehicle they’ll be driving. In fact, the Department of Homeland security began the process of commissioning a new presidential limousine back in 2013, and now news sources have caught footage of a camouflaged prototype for the next generation machine. A General Motors spokesperson would still not confirm to the press (yet) that the automaker is developing this new limousine, but the secret is out as of a public record indicating that GM has been awarded three contracts for the project, and the vehicle seen in a spy photo published by Autoblog is dressed unmistakably like a Cadillac. It appears to be the same size and shape as our current President Obama’s car, while featuring the brand’s newest grille and headlight designs. 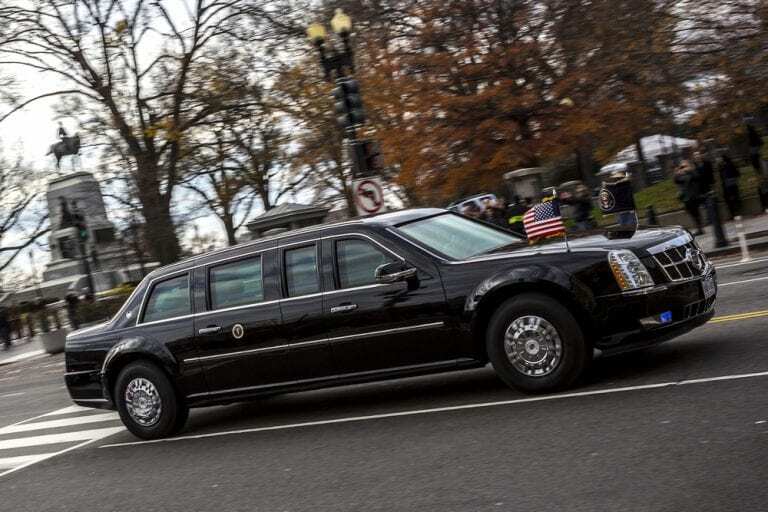 According to corroborated sources, U.S Secret Service uses and maintains a fleet of 12 identical limousines that are used in Washington, D.C., and transported around the world to support the President’s various activities requiring a drivable commute. The specific cost for each vehicle is undisclosed, but has been estimated by some to be upwards of $1-$1.5 million. So far, the total paid to GM for work on the 2017 model has been reported by USA today as $15,800,765. This new car will more than likely make its public debut on Inauguration Day, January 20th. And as always no regular Joe should expect to pick up one of the old ones at a junkyard or dealership since they all get redeployed for use by other government officials. Like a hand-me-down car! Sometimes they end up at the library of the president associated with it. We’ve spoken about how little we know about the car’s new features. Best we can gather is that it will undoubtedly have all old the features that we DO know of: it’s bulletproof, has all sorts of on board computes and gadgets/communications devices, has an onboard secondary air supply in case of a chemical or biomedical warfare attack and so forth. It should be noted that the new model is being talked up as “Bomb Proof” however. No word on how that works though and rightly so. We can also assume that the expected communications and safety technology will receive an upgrade as well. So whether it’s Bernie Sanders, Donald Trump, Hilary Clinton, or anyone else in the current crop of candidates, you can look out for our next President riding in their brand new car, complete with an entire motorcade that delays commuter traffic like no other on the way. But that won’t be until 2017, so we have awhile until we see the new “Beast” on the road!